A couple of weeks ago I was talking to my parents about a huge reading list I received for one of my classes at the University of Toronto. I must have read out loud a dozen names, but the one my mom memorized was “Larry Winget”. I don’t know how many books he will have by the time you Google his name several years from now… today he has several. What did grandma decide to buy for me? 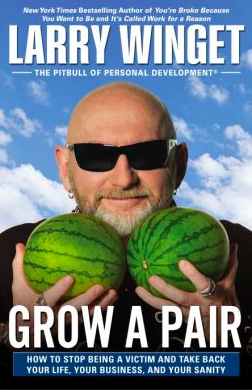 “GROW A PAIR”. What is she trying to say? Now… I am sure the book title misled her… as you know English is not her first or second language so perhaps she doesn’t know what “growing a pair” means. At any rate, I told her what it meant and we had a big laugh. I haven’t started reading it yet but your Godfather picked it up on the coffee table after dinner. He liked it so much he ordered his own copy at Amazon. Anyways… Larry really believes in the power of asking. He believes that rejection is a myth. Let’s say you like a cute girl in school and you are afraid of asking her out. Before asking her out, you don’t have a date. If you ask her out and she says no, you still don’t have a date. Either way you are exactly in the same spot. “But dad, then she will know I like her! !” Right… and you will also know she doesn’t like you that way. It may hurt at first but you will be alright. Earlier today I tried to attend a University class. I thought it was going to a presentation on blogging. I emailed the professor and asked if I could attend. Turns out I was misinformed on the topic. Before I asked: At 6PM I was going to walk my dog. After I asked: I am going to walk my dog at 6PM, I know I am not missing out on the chance to attend a cool class and I feel pretty good about taking initiative. I grew a pair! I don’t care how old you are. Ask for a cookie, ask for new toys, ask for a BB gun, ask the officer if he can let you go just this once, ask your boss for a raise, ask your wife to help with the dishes, ask your roommate to shower more than once a week, ask your mom for a hug when you need one. Rejection is just a word we invented. Cast that word away. You will live a better life.